Dr. Suji Park-Idler is a board-certified diplomat of American Board of Internal Medicine since 2006. She completed her training and partnered at UCSF. She is wholly invested in feminine wellness. She has been addressing urinary stress incontinence, vaginal dryness and sexual dysfunction since opening her practice in Raleigh, NC 2010. She is growth-minded to look for innovative medical approaches targeted to feminine wellness. 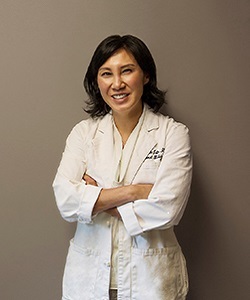 Dr. Suji Park-Ilder is one of the most experienced ThermiVA providers in the United States and is one of the first vConfidence certified providers to deliver both ThermiVA and Geneveve by Vieve. Her approach is to be open-minded and empathetic to each one of her patients, so she allocates her time answering any medically-related questions, giving guidance and direction to all available options and performs ALL procedures herself.